Tell and write time to the hour. Tell and write time to the half hour. Tell and write time to the quarter hour. Tell and write time to the nearest 5 minutes. Tell and write time to the minute. Makes sense, right? Start off easier, work your way up the ladder of difficulty. Here’s the thing: It’s going to confuse a lot of kids. I taught middle school special ed for 8 years in an inclusion program. I worked with students with and without IEPs. You’d be surprised at how many older students simply couldn’t tell time on an analog clock. These days it’s even worse, because they rely on digital clocks through their phones. So I wondered, what was the reason for this? We’re teaching kids incorrect information. You might be thinking, well what’s wrong with that? Kids should start off with easier concepts. This is a wrong approach because we’re teaching kids that the hour is whatever the short hand is pointing to. They get that notion stuck in their heads, and every time we try to teach a new skill, such as time to the half hour or quarter hour, students have to readjust their misconceptions and realize what they learned before was wrong. While some students make this adjustment quickly, there are many students who take longer to unlearn the wrong ideas. For some students, this sticks with them for years. By the time students are learning how to tell time in 5 minute intervals, many will say 9:55 is 10:55. Why? Because the short hand is closer to the 10. They learned this in 1st grade! They were good at telling time in 1st grade! Ok, ok… so then what? How should we introduce telling time? Show kids that each hour has an area or space that belongs to them. I tell my kids that each number has a room. Later on, they will realize the hour hand moves, but in the beginning they won’t get the concept. However, you can show them that when the short hand is in the number’s room, that’s the hour. I use a clock that separates the face of the clock into the areas by color so it’s very clear where the hour hand lies. Kids will realize from the beginning that the hour hand is different from the minute hand. The minute hand points to a specific number as indicated with the little marks. The hour hand has a space. Vary the times as much as possible. Ask them ONLY to identify the hour. Fill in the minutes for them. You have to teach them that the number’s room comes AFTER the number. So if the short hand is pointing right at a number, then the number’s room is the space after it. Begin with the introduction visuals. Then remove the numbers within the colored areas. Then remove the colored areas. Continue practicing without the visual supports until they have mastered finding the hour no matter where the minute is point to. Now you can teach telling time to the hour! By introducing time in this manner, you will save teachers in 2nd grade and beyond the headache of having to reteach this concept. Not to mention, the kids will not have to relearn the ideas that were drilled into their heads for months! For a free PNG file of a colored clock face, head over to my store. You can use it make your own worksheets. If you want to save time, I have a kit to get you started, with posters and worksheets. Cindy Lee runs Ainslee Labs at TpT. She is currently teaching K-3rd grade in Chicago, a mixture of special education resource and inclusion. Cindy loves looking at new ways to teach old concepts. You can read more about her education adventures on her blog, Ainslee Labs. You can also find her on Facebook, Pinterest, and Instagram. *This post was originally written as a guest post on Teacher Approved. I was given permission to repost it to my own blog. Thank you! I’m excited to have another guest post, this time on Teacher Approved. Teacher Approved was created by one of my favorite TpT stores, Second Story Window. Introducing affixes? Here’s a visual introduction: On a cheap t-shirt, get colorful markers and write words with prefixes on the front and words with suffixes on the back. Or use duct tape (as shown below). Students can remember where prefixes and suffixes are positioned. Go to your local game store and you’ll find a great selection of cool dice! My personal favorite is the 20-sided die. If you’re working on the “counting on” strategy and don’t want your numbers going higher than 4, there’s a 4-sided die. There’s also a “fate” die (pictured above) that has + and – symbols. I also have dice with multiples of 10. You can come up with so many dice games! Why use desks as white boards? The kids think it’s awesome. This is the only time they get to write on furniture. They’re free (for you). The school already has them. They’re already there. You can save yourself the time of passing out all the white boards. They’re big. Plenty of space to write on. I love collaboration, because the best ideas sprout from them. I was talking to my principal about my student mentioned in a previous post, Andy, and how he finally made his first breakthrough. My principal showed me a few things to help encourage Andy’s progress. From that conversation, I came up with a totally new and different approach that I call Sound and Spell. Sight words can be tough, because 95% of the time, it’s a matter of practice, practice, practice. Not all students get enough repeated exposure. Giving them worksheet after worksheet can get boring, unless you make it engaging. With that in mind, I created this packet for my struggling students. I wanted to pack in as much practice as possible but not use a ton of paper. Guest blog at Minds in Bloom! I’m so excited that Rachel Lynette of Minds in Bloom has allowed me to guest blog on her website! Her task cards saved me quite a few times when I was teaching middle school. I offer 5 tips about how to keep your kids in line, but still maintain at atmosphere of respect and learning. I’ve found that even though I am firm, sometimes unbending, the kids end up appreciating it. Check it out! All teachers have a general toolkit of ideas that works for majority of kids. But once in a while, you’ll encounter a kid who just can’t seem to make sense of reading. As a special ed teacher, I need to pinpoint strategies for the 5% of students who have needs that general education teachers can’t meet. That requires me to think outside the box. One of the reasons I wanted to start a blog is to share out ideas. If something worked for me, then it might also work for you. Learning is such a complex endeavor, and we could all use fresh ideas. I really wanted to devote more time to my blog, but my first quarter at my new job has been quite time consuming! I love it at my new school, and I have plenty of opportunities to develop new materials that I am adding to my TpT store. I have tons of ideas for blog posts that I have brewing in my head, so I have a lot of writing to do! 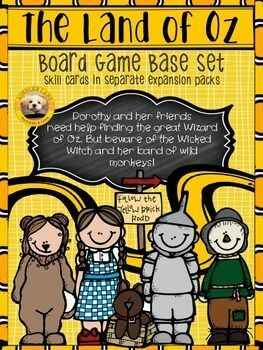 Since opening my TpT store, I created a board game called The Land of Oz. Right now there are expansion packs that range from kindergarten to 5th grade level for reading sight words. In the near future, I am creating expansions for mental math. For now, keep in touch! Email me at ainsleelabs@gmail.com, find me on Facebook, Pinterest, or Ainslee Labs at TpT. Proudly powered by WordPress. Theme: Flat 1.5.4 by YoArts.